Jewish Home chairman blasts Herzog over a tweet attacking Netanyahu and blaming him for the Rabin assassination. 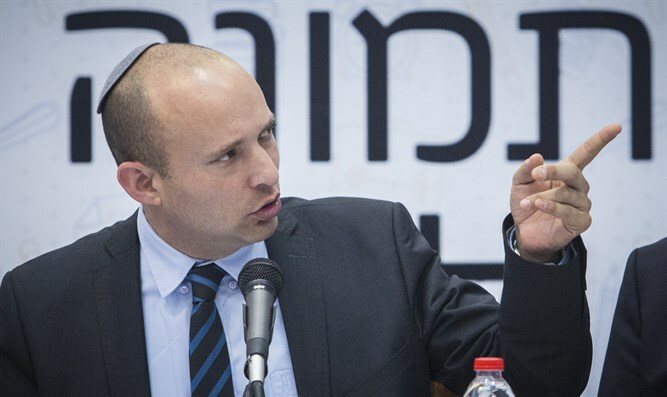 Jewish Home chairman, Education Minister Naftali Bennett, on Saturday night blasted opposition leader MK Yitzhak Herzog over a tweet he posted attacking the nationalist camp and Prime Minister Binyamin Netanyahu. Herzog had earlier tweeted “the hatred is the same hatred, the incitement is the same incitement and the leader is the same leader” – a quote which he later repeated in his speech at a rally in Tel Aviv in memory of assassinated Prime Minister Yitzhak Rabin. Herzog was repeating the left’s longstanding claim that incitement by rightist leaders, and specifically Netanyahu who headed the opposition at the time, led to Rabin’s assassination. Bennett also rejected the comments by coalition chairman MK David Bitan, who caused an uproar on Saturday when he asserted that Rabin’s murder was not political. “The murder was a political murder, of course. The lesson is this: Even if there is a deep disagreement between left and right, we will express our opinion and we will fight for it using democratic tools, but we must never raise our hand over our brother. Period,” wrote the Education Minister. “Once you turn the murder into a tool with which to silence an entire community, you are hiding the real lesson. I am fiercely opposed to a Palestinian state (by the way, Rabin too was against it). Should I be silent? Do you expect me not to fight for my views in the name of the Rabin assassination? Is this the goal? We lost a country here 2,000 years ago because of hatred. We must not lose it again,” said Bennett.